Like most common names, "Red Quill" can refer to more than one taxon. They're previewed below, along with 10 specimens. For more detail click through to the scientific names. These are often called Red Quills. These are sometimes called Red Quills. These are very rarely called Red Quills. 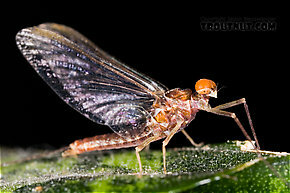 This intriguing species has two distinct colors of nymphs, which were once considered to be different species. 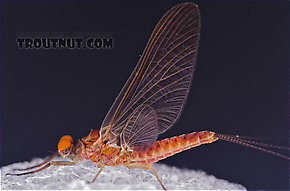 Most nymphs are a dark olive gray, but some are a surprisingly bright reddish brown. The red ones were once classified as Rhithrogena sanguinea. There is no apparent difference between the adults of the two varieties. 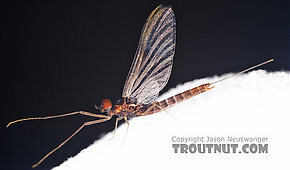 Ehhemerella tibialis (Little Western Red Quill, Little Western Dark Hendrickson) is a common western species that can be very important at times. It is perhaps also one of the most confusing species. Unlike it's western generic counterparts the species is described as dark and their females produce dark eggs. Until recently, it was classified in the Serratella genus with species that share these traits. Regardless, it is the only small, dark ephemerellid the western angler is likely to find important. Favorite patterns used for size 18 Pale Morning Dun hatches tied in eastern Dark Hendrickson colors should be the ticket. As with many of it's sister species it is widely adaptable and may be variable in its appearance. 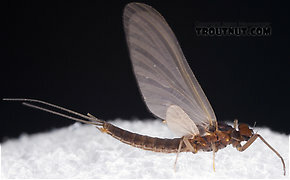 Scientific literature and many angling sources describe it as a small dark mayfly. Not everybody agrees. 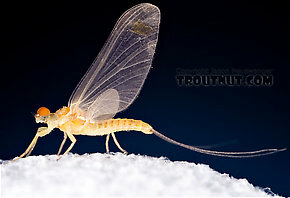 Ralph Cutter, West Coast author of several angler/entomology books and articles describes it in Sierra Trout Guide as a much larger pale mayfly and dubs it the Creamy Orange Dun. 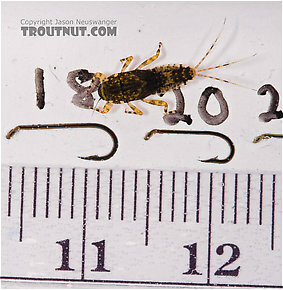 He also mentions the nymph as being easy to recognize by the feint dorsal (Dorsal: Top.) stripe running down its back and its often fiery brownish red color. 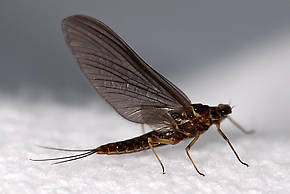 These descriptions also match a variation of the ubiquitous and common Ephemerella excrucians.